We have come a long way (most of the time) in our advertising. Look at this ad for cordless phones. I personally do not remember this one but look how fancy. Not real appealing in today's market. This next one I think would have been marketed to the lady who was put in charge or looking to be moving up in the world. A look back to the way back in advertising. A fun post. LOL, yes indeed. How about Joe Namath selling pantyhose? Or Noxema? Technology is really moving at a fast pace William. 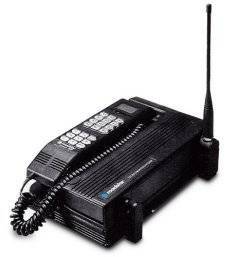 My first cell phone was purchased back in 1989 or 1990. It was a thing that had a handle so I could carry it around like a purse, and had a cord on it. Here's a picture. I dont recall either of these adds, but I do remember the first cordless phones. Hi William. Times certainly have changed over the years. Good morning again William. I had this conversation with a youngc olleague just this past weekend.